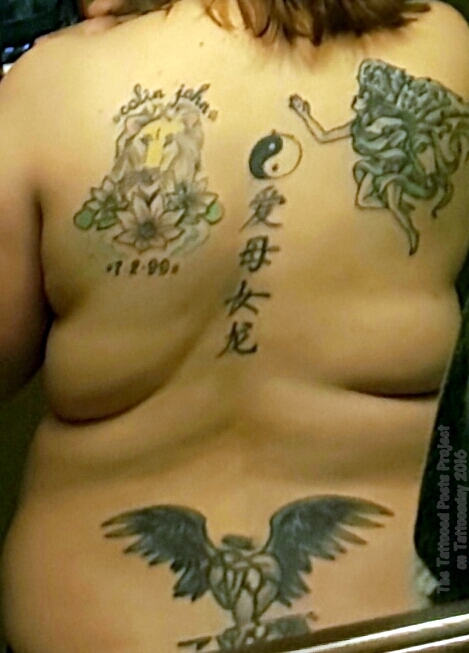 "My first tattoo was my lower back, designed by an online acquaintance. A broken heart, sewn together with the initials of my two angel babies. Unexpected pregnancies that ended in miscarriage in my 20s ... My left shoulder blade is a dedication to my son. My right shoulder blade is an angel on my shoulder. The center kanji symbols says Dragon-Woman-Mother-Love." The back tattoos were inked at Fine Line Tattoo in Topeka, Kansas. 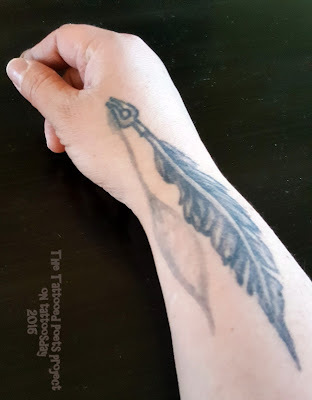 Emily notes "my right wrist reminds me that no matter what job I have and no matter where I am in life, that I am a writer." This was done at 46 & 2 Tattoo in Fargo, North Dakota. 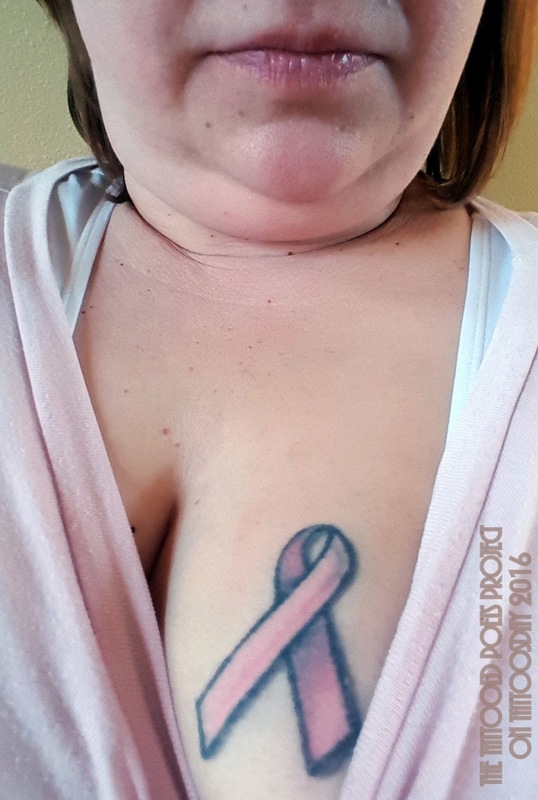 She adds, "my pink breast cancer awareness ribbon [is] for my mother who is now 8 years breast cancer-free." Emily notes "Sunflowers are my sister's favorite flower. She is on my ankle because she is my stability. Tulips are my favorite flower." The tulips were done at 46 & 2, and the sunflower was inked at Addictions Tattoo in Fargo. Emily sent us the following poem, which was originally published in Void Magazine in 2006, and then republished on www.writingraw.com in 2015.
place my napkin gently on my lap. tables with service for one. as the seconds tick tock and tease. Emily Vieweg is a poet and playwright originally from St. Louis, Missouri. Her work has been published in Foliate Oak, The Voices Project, Northern Eclecta, Red Weather Literary Magazine, Soundings Review and more. Her chapbook, "Look Where She Points" is forthcoming from Plan B Press. She lives in Fargo, North Dakota where she is a mother of two, pet parent, data processor, educator and human rights advocate. 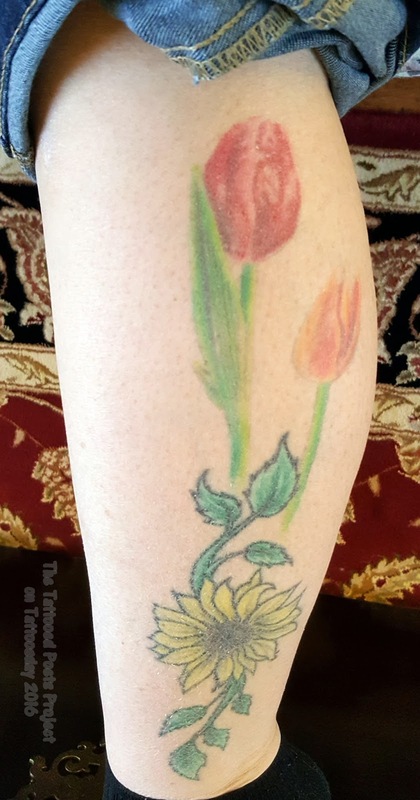 Thanks to Emily for sharing her tattoos and poem with us here on Tattoosday!